Taking a break from traditional recipes today, and showing you how to make your own homemade dried basil powder instead. 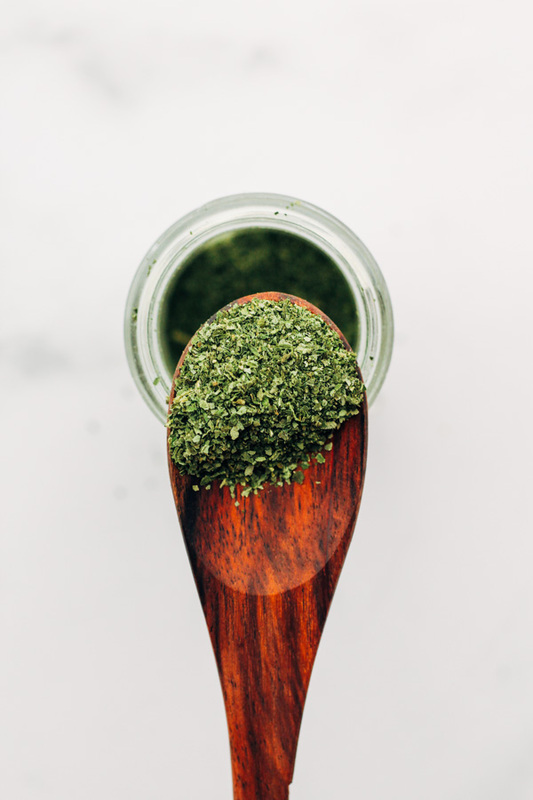 I love anything and everything that is 'homemade', and DIY homemade herb powders are definitely on that list. Of course in order to make this recipe you will need a basil plant (obvs), and a dehydrator... but even if you don't have these two things, you should definitely keep on reading to learn why you should grow your own basil plant! If I had to choose one herb that I believe is the easiest plant to grow - I'd have to go with basil. At least that has been the case in my experience. Yes, there are a ton of other easier herbs to grow (cilantro for example), but in my experience I have actually had the most success with basil. It doesn't need much space. You can grow it in a small pot like these ones (affiliate link) and keep it in your balcony/backyard or, if you have the space, you can plant it directly in the soil in your backyard or in a raised bed (that is how I grew mine). Low maintenance. Basil is not a needy plant.. plant the seed and water it often.. and it'll grow and grow and grow. However, you do need to trim the flowers once they begin to pop up though because once flowers bloom the basil plant stops growing. It keeps giving back. Once you trim the basil leaves to use them, the plant will continue giving you basil leaves and it can do this for up to one year! You get to use the freshest basil in your recipes, which I promise is so much better tasting (and smelling) than the basil in the stores. Fresh is best, there's no doubt about that. And of course you save moneyyyy - basil is expensive... and every time I buy it in the store I never have enough time to use it all up because it spoils really quickly. Having my own basil plant has allowed me to save on the expense of having to buy store-bought basil. 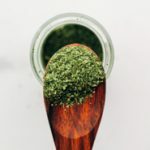 Making dried basil powder is actually really easy, and a great way to put some of those basil leaves to good use before they spoil. Like I mentioned above, the basil plant tends to grow easily and gives you a lot of leaves. I try to use my leaves in my cooking as much as I can, but sometimes I can't keep up with their growth. When that happens, I make dried basil powder! Then, dehydrate them using your dehydrator (I use this Excalibur one - affiliate link). 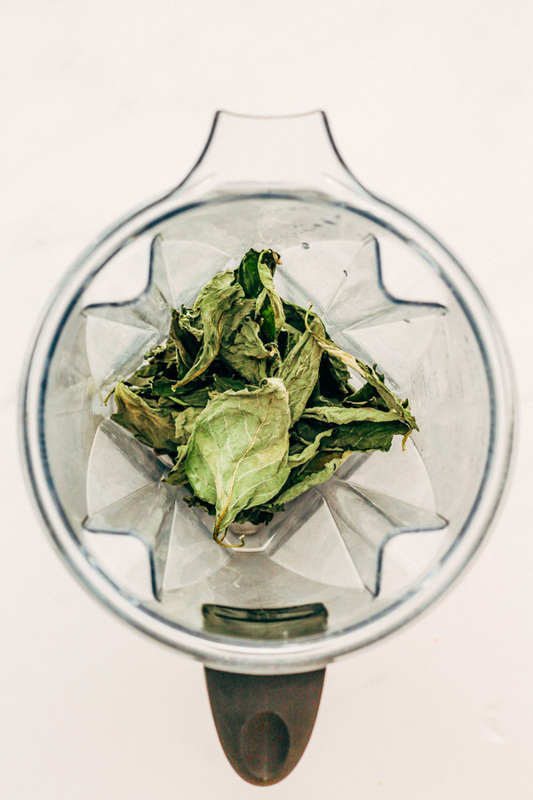 If you do not have a dehydrator, this article outlines different methods for drying basil leaves including oven-drying and solar drying, which I think is pretty neat! Please note I haven't tried any of the methods outlined in that article. And, then blend the dried leaves using your blender... you can probably get away with using a food processor or coffee grinder as well, but I have yet to try those methods. Store the dried herbs in cute spice jars like these ones (affiliate link) or do what I do, and just reuse old empty ones that I have on hand. And just like that, you've got yourself some dried basil powder to use in all of your cooking. Homemade dried basil smells so much better than what I buy in the stores, and the taste is also much more potent. Need other ways to use basil? Check out this pesto stuffed mushroom recipe which is sooo good and a perfect way to use up your garden basil. An airtight container to store the powdered basil. I use an old empty spice jar. Pick your fresh basil, rinse, and lay out the leaves onto dehydrator mesh trays. I used up a total of 3 trays. Anything less than 3 trays probably won’t blend well enough, it’s important to have enough basil for the blender to work properly. Dehydrate at 105F for 10 – 15 hours. I give a range because dehydrating times vary by machines and by geographic location. Once basil is fully dehydrated, blend using a high powered blender such as a Vitamix. The more basil you have, the better the blender will be able to process it. You can try using a coffee grinder or food processor, but I have not tried these methods. Store in a spice jar, and use in your favorite basil recipes! I keep my dried herbs in room temperature (and it gets pretty hot here in south florida) and all of my spices are always okay, but it is wise to always check your food for signs of spoilage. It is important that the basil is completely dried before you blend it up or else you will have moisture and that allows bacteria to thrive, and leads to spoilage. 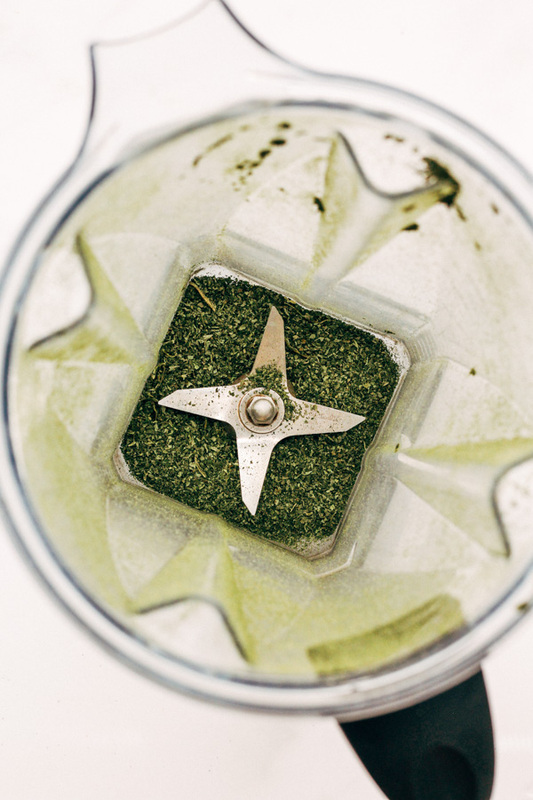 I found that using a food processor works better than my blender for grinding up the dry basil leaves, I also do the same with our garden grown kale and add it to recipes during the winter months. No more expensive “greens supplements” from health food stores. Using kale is such an awesome idea! We’re growing our own kale this fall (we’re in Miami so fall time in the garden is like spring elsewhere lol), but anyway that will be a great way to put my kale to good use. And yes, I agree the food processor (and sometimes even a coffee grinder) works better for me sometimes as well. And I hear ya! I love saving money by making my own things at home! <3 Happy Tuesday! !